Lanard’s Ultra CORPS! series of twelve inch figures has had something for almost everyone. If you’re into straight military style outfits and accessories, you’re covered. If you like the adventure side of things, that’s an option as well. If the modern army and character vibe of 1980s GI Joe floats your boat, the line includes a variety of them also. Finally, if you’re like me, and I know I am, you may go for all-out bat excrement crazy concepts. Brother, have I got a figure for you. 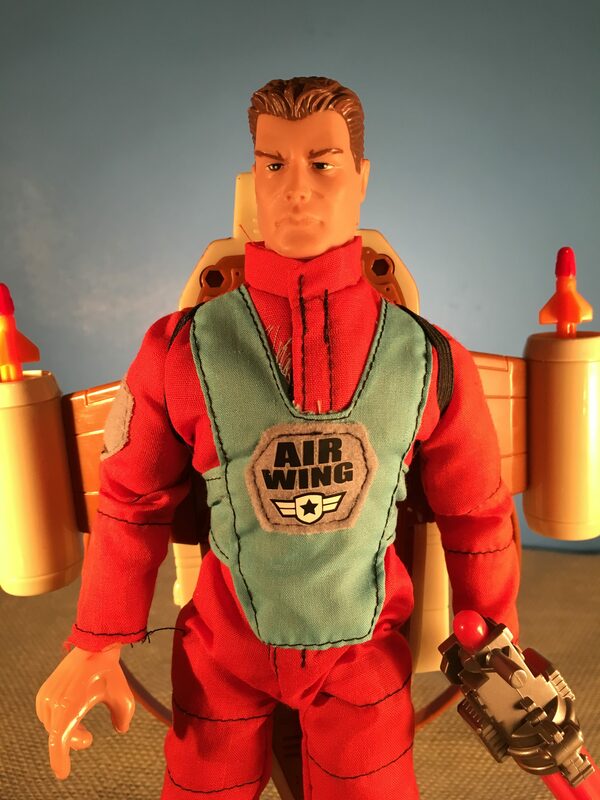 Witness a member of the AirWing Force, a subset of figures equipped with ginormous aircraft-shaped backpacks. 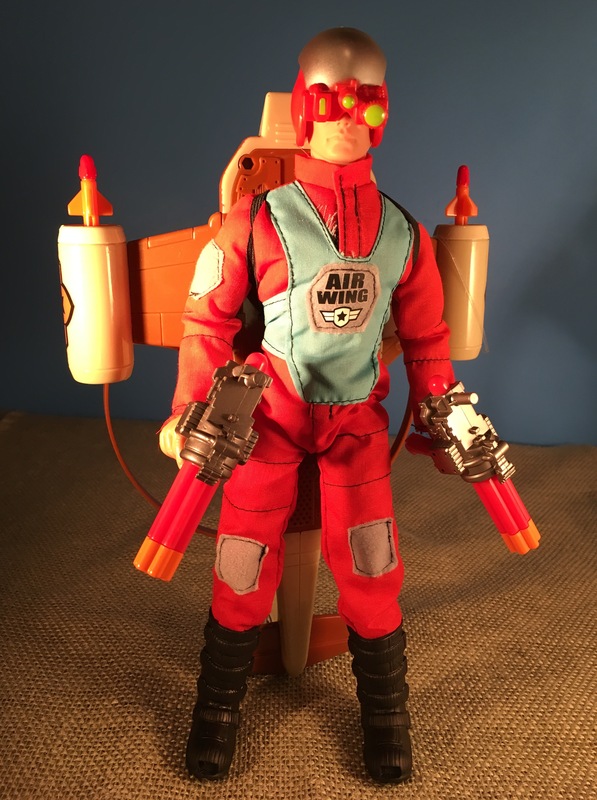 The figures in this set don’t have proper names, so I suppose this one could just be called Helicopter/Minigun Guy. I can’t get enough of the ridiculousness of the concept. 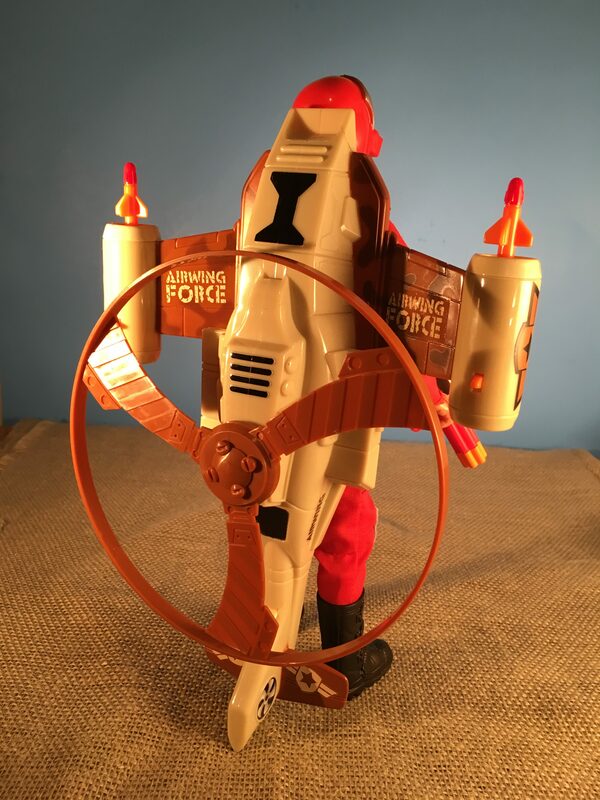 When I first spotted the AirWing figures at the Lanard sale a few years ago, I thought they were simply pilot figures that came with out-of-scale vehicle accessories. It wasn’t until a closer inspection that I discovered the vehicles were flight backpacks. It’s as if the GI Joe Super Sonic Fighters made their way to a twelve inch scale. Generally a helicopter backpack concept puts the prop mechanism over the head of the pilot, but Lanard eschews this age old wisdom to strap an Apache-style attack helicopter parallel to its operator’s back. There are action features as well: the rotor spins when you pull the trigger located in the tail section, as well as two firing missiles. If you thought it couldn’t get nuttier, check out the armament–dual handheld miniguns. We haven’t seen the likes of this since Rock ‘n Roll wielded two similar monstrosities. Is there a military version of workers compensation? Because someone’s going to develop a serious case of lateral epicondilitis if they have to fire these crimes against ergonomics on a regular basis. This screams so much fun without looking too much like a dollar store figure. And the huge backpack reminds me of Centurions just a little bit.